There comes a time in the life of every woman pretending to be a farmer’s wife when she must man up and act like the real thing. So this morning, I had to get up early to feed a shed full of young calves, and then help Pete to load two bulls on to a trailer. Actually, Pete did all the dangerous bits and I stood around and waved a stick while trying to look scary and failing to convince. Well I didn’t convince myself, although for some inexplicable reason the bulls did keep their distance, so maybe I did look fiercer than I thought. I don’t mind helping with cattle as much as I used to, but our huge Limousin-Charolais cross breeds are still daunting to Townie Wife. I’ve asked my wonderfully kind husband to buy smaller cows- you can get them, they’re called Dexters (the smallest breed of British cattle) – but so far his devotion hasn’t extend to changing his livestock priorities. I wonder if I can find a way to convince him? Oh how I’d love a farm full of these lovely little Dexter cattle.. 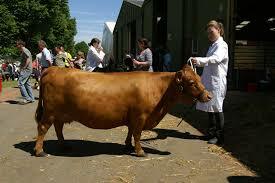 Categories: Farmhouse blog | Tags: Dexter cattle, farmer's wife, livestock | Permalink. I knew I was in trouble back in 2007 when I found myself getting up close and personal with the new man in my life, while up to my knees in thick mud (I’d been invited to visit his farm). I clearly like this man a lot, I thought, to negotiate a quagmire in the middle of an unseasonably wet winter. That moment was the beginning of a steep learning curve and a transition period of several years as I morphed from a sheltered townie journalist to a somewhat atypical farmer’s wife. Three months after meeting Pete, I was having my first lessons in lambing- but unlike Lambing Live presenter Kate Humble, I managed to slip a disc in my back. Not an ideal start for a relationship – but I did make a comeback, and I even learned how to deliver a lamb the following year! I followed that by helping with lambing for the next five years, often on the late shift, and sometimes after a hard day in a news room when I was working as a reporter. You would probably be quite impressed if I told you I am now a red-hot stockwoman, but the truth is, huge black Limousin cows still scare me, though I do stand my ground, armed with a big stick, when Pete needs help moving them around. It makes more sense for me to do what I’m good at- copywriting, journalism and blogging-while Pete runs his farm. I could no more change into a farmer than he would want to sit in my cosy farmhouse office and work indoors for a large chunk of the day. But life has certainly changed. I am based at home, and it works fine, as I’ve never yet missed a deadline. The flexibility is a bonus as I am occasionally needed to help round up rebellious heifers when they make a break for freedom! And while I’m blogging like mad for my clients, I can keep a lookout for visitors to the farm, and take messages. It’s a different kind of life, with its own challenges and plenty of perks- an office with a lovely view is just one of them. 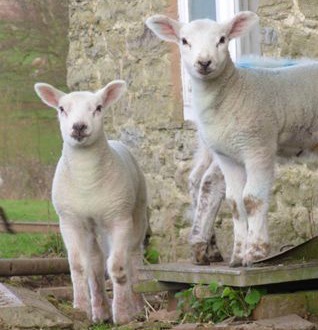 In my farmhouse blogs, I will share a few snippets about life in Shropshire- and I guarantee some of it will make you smile. Categories: Farmhouse blog | Tags: farm life, farmer's wife, lambing, romance, Shropshire, Townie | Permalink.